Dual shower heads are a super popular option right now. They feature a handheld fixture and a traditional shower head in one convenient setup. These combos are easy to install, and they give you a versatile shower experience. The one downside is that the vast majority of dual shower head/combo models are absolute garbage. They’re gimmicky $20 knock-offs made from cheap plastic and designed appallingly badly. If you’re interested in a dual model, but want to avoid the garbage options, read on! We’ve rounded up a range of solid, dependable shower head combos. This Peerless combo set is our least expensive recommendation for a dual shower head. It’s the most affordable model we’ve found by a major plumbing company. This one’s priced with the junky knock-off’s, but it has a more sophisticated design and a real manufacturer’s warranty standing behind it. As a general rule, we don’t think you should buy any all-plastic fixture unless you’re on a very tight budget. With that said, combos made from mostly metal are fairly expensive. This Peerless set is our recommendation to anyone who can’t spend much on their fixtures. It’s made by an actual company. The vast majority of other dual setups at this price (and all the ones below it) are made by knock-off manufacturers or cheap companies that don’t make any real plumbing fixtures. They’re gimmicky and wastes of money. The Peerless may be inexpensive, but it’s from a company that also makes high-end fixtures. You can tell the difference in the way the spray heads function, as well as the overall build quality of the pieces. It looks a lot more expensive than it costs, even if you’d never mistake it for a $300 model. The nickel finish does look like metal, and while it’s certainly light, the whole thing feels sturdy. It covers all the basics. You get two shower heads, and a diverter bracket. One head is a fixed spray face, which is designed for either overhead use or an angled/horizontal flow. There’s also a handheld fixture which sits in a bracket above the fixed one. The bracket itself has a diverter valve built in, so you can choose where the water actually comes out. You can run both or one shower heads at any given time. There are lots of options with this one, even though it’s cheap! You don’t need any additional fittings, since the bracket fits right onto the end of your pipe. Each of the heads is adjustable, as well. Dials built into the spray faces give you options from a focused massage spray to a gentler rain-like flow. The Peerless has a surprisingly good hose. It’s not stiff at all, but it still feels rugged. This one won’t last as long as a metal component, but it’s as good as anything else in the budget range. It measures 5 feet in length. It’s lightweight. The whole assembly weighs only about a pound. Both fixtures in this package have easy-clean spray faces. They wipe clean of fingerprints and deposits quickly. It meets 2.5 GPM flow rate standards. Many of the sketchy options at or below this price don’t actually meet water regulations. It also meets building codes, as well as safety standards for plastic and chemical content. That’s certainly not the case with most of the off-brand options we’ve encountered under $50. It’s covered by a lifetime warranty. And while many other inexpensive models will cite warranty coverage, this one’s offered by a company with a very good reputation for standing behind their products. It’s all plastic. This is certainly sturdier than cheaper knock-off models, but it’s not fair to compare it to a mostly metal or all-metal unit. This one does feel a bit cheap, even if it’s better than other inexpensive options in that regard. The hose probably won’t last for more than a few years, and the finish isn’t going to hold up as well as a more expensive piece. For the money, though, it’s very good. There aren’t any finish options to choose from. The Moen Refresh is a step up from the Peerless in every department. It’s more rugged, more versatile, and more user-friendly. It’s made with lots of metal components, so it’ll last you for much longer than an all-plastic fixture. It’s our top pick in the affordable price bracket! We think it’s the better budget buy for folks who aren’t absolutely strapped. As with the Peerless, you get one fixed shower head, one handheld unit, a hose, and a bracket/valve combo to mount everything. The bracket includes a 3-position diverter valve, just like the one on the Peerless. You can choose to have either or both of the heads running at any give time. It does a good job distributing the pressure evenly, and there’s not a huge drop in output from each when the other is running simultaneously. The 4” spray heads give you a bit more coverage than those on the Peerless. As with the cheaper model, the Refresh’s heads are adjustable. There are 5 different settings on each, with everything from massage to rain shower. Like the Peerless, the Refresh comes with a 5-foot hose. It’s designed to be kink-free, and while it’s not premium, it works quite well. It’s actual stainless steel, while the Peerless’s hose is coated plastic. The whole thing looks and feels less cheap than the Peerless. The Moen is a mix of brass, plastic, and stainless steel components. It has a better finish, even on the plastic components, and it’s noticeably sturdier. This one fits right on your pipe as well, with no extra fittings needed. It meets all current code and usage requirements, with a 2.5 GPM flow rate. The bracket for the removable head isn’t the most well-designed we’ve seen. It does have to be set at a fairly steep angle to stay in securely. It could be deeper set, but it’s not a huge problem in most setups. It’s not all metal. Sadly, you won’t find a combo unit made completely from metal components for under $100, or $200 for that matter. Still, the Refresh is made better than anything else in its class. A top Wirecutter recommendation, Delta’s H2OKinetic combo is an excellent midrange choice. It’s also our favorite “all-in-one” combo. These are models which have two interlocking shower heads, as opposed to two distinct fixtures. The hand unit fits right inside the fixed unit when you’re not using it! The Delta offers plenty of versatility for the price. We also like the wide range of finish options available. It has a metal hose and a unique aesthetic that works well with a range of decor. We suggest it to anyone who wants a combo that’s more visually neat than others! This model uses Delta’s H2OKinetic technology, which we’ve enjoyed on their low-flow models for a number of years now. This design uses special spray channels to make big fat drops instead of scattering water droplets into a fine mist (as so many others do). The result is a great sensation, designed to make it feel like more water than there actually is. It doesn’t feel needle-y at all! It also helps to preserve heat, since you’re not dissipating all that warmth into mist. This is a very satisfying choice for people who like big drops and a more intense feeling from their shower. Here, you get that unique sensation in two different shower heads. As we mentioned, Delta’s design fits the hand unit right inside the overhead fixed unit. It’s a neat, unobtrusive package that looks less “busy” than the rest of our recommendations. Like most of the combos we recommend, there are three diverter valve options: run the hand unit, the fixed unit, or both at once. There are a few different options for the spray pattern, too. You can go for full spray, or a focused massage mode. There are also variants within those: a full spray with massage, or a slowed down massage mode with big drops. While this isn’t as versatile as the Moen or Speakman, it’s the most versatile integrated combo we’ve found. You can also temporarily stop flow to save water! This is included as a spray setting rather than an additional trickle valve, but it’s still a great feature to have. You can save a heck of a lot of water by just turning things off while you lather/soap up. The Delta cleans easily with flexible spray nozzles that loosen deposits. They’re pretty standard, and we have no complaints. It’s easy to install, too. Like most of our recommendations in this category, it hooks right onto your overhead shower pipe. We love the looks of the Delta. It has a funky aesthetic that recalls older telephones to us. It’s not quite old-fashioned, but nor is it a sleek, streamlined modernist fixture. Since it’s not locked to any specific aesthetic or period, it manages to be quite versatile. Magnetic docking keeps the hand unit locked into the overhead fixture when you’re not using it. Unlike a lot of cheaper systems that use magnetic docking, this one actually works properly! That shouldn’t be a novelty, but it is in today’s market. Despite the big droplets, it’s still efficient. This combo meets the EPA’s 2.5 GPM flow rate standards in all modes. It comes in 5 finish options. That makes it easy to find one that matches your decor. They’re all the same level of build quality, too: mostly plastic, but sturdier than many at this price. In any case, the hose and the fixed head are metal. Like any Delta fixture, it’s covered by a lifetime warranty. It’s not narrow by any means, but it offers less coverage than some others (such as the Speakman below or the Grohe). The big drops are satisfying, but can also make things feel less immersive. Since the volume is more focused, it doesn’t offer the same feeling of being completely underwater that you get with something like the Grohe. It’s not as versatile as the Speakman below or the Moen above, though you certainly get a decent amount of options. Some people won’t like the H2OKinetic spray pattern. It’s a bit “splattery”, since it works in an oscillating flow. The push-button piece that controls the spray pattern will likely wear out over time. It’s not as resilient as the swivel-controls you get on most other combos. With that said, it’d certainly be covered by warranty. Even though it’s made with close to the same amount of metal vs. plastic parts, the Delta feels chintzier than the Speakman Caspian. This Speakman model is a super popular choice right now. It’s a combo set which includes the company’s best-selling Anystream fixed shower head with a matching hand shower. Both have a timeless look which works with both contemporary and classic decor. This dual shower head set will cost you $50 more than the Kohler or Moen, but it has the build quality and versatility to justify the extra money! We think it’s the best choice for folks who appreciate versatility, and want lots of spray options. Both shower heads follow Speakman’s Anystream format. The Anystream spray face has 8 different “hubs”, and each has 8 little nozzles inside. So, there are a total of 64 different nozzles on each shower head. To adjust them, you can spin the adjustment ring through a 360 degree range. The big appeal of the Anystream is that there aren’t a set number of flows to choose from. You can find the one that suits your exact taste on any given day! There are pretty much infinite options, from a gentle shower to a pulsating massage. The Speakman Caspian is a bit different from the models we’ve looked at so far: it has a fixed shower head that’s fitted with a diverter valve and hose, plus a handheld shower head that sits in its own bracket. You get the wall mount bracket for the hand shower in the box. The benefit of having an independent bracket for the hand unit is that you can position it anywhere you want. That solves a common problem with the other combo units, which can have problems with slipping brackets if you position the fixed shower head at an angle. With the Speakman, you can arrange things however you want, and always be able to get the hand unit securely in its bracket. You can get it in either nickel or chrome finish. It’s a nicely versatile aesthetic in either finish. we think it works well in both classic and contemporary settings. It has a solid brass diverter valve. That’s the component that takes the most wear and tear on a daily basis, so solid brass build quality is a big upgrade! As with the recommendations above, the Speakman comes with a 5-foot hose. It’s entirely made of metal, and matches the finish of the shower heads. The whole thing is a bit heavier than the Kohler or Moen. That’s because it has more metal parts overall, even if it’s still partially plastic. Like the Moen and Kohler, you won’t need any extra fittings or components to get up and running. 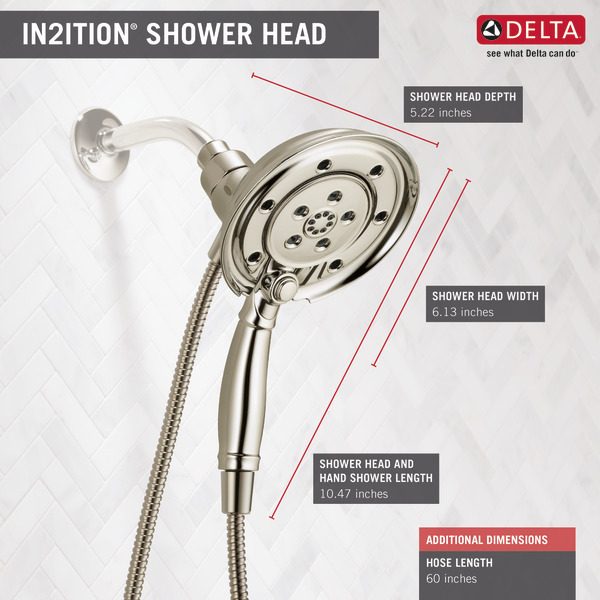 It has the best reliability record of any semi-plastic dual shower head we’ve seen so far! The only models that beat it are all-metal fixtures like the Hansgrohe below! Even though the Speakman has some great solid brass components, like the diverter valve, it’s still built with plenty of plastic. That’s a bit disappointing for the price, but sadly par for the course with dual shower heads. It uses more water than the Kohler, even though it meets the same 2.5 GPM flow rate as our other picks. Unlike the recommendations above, the Speakman doesn’t allow for both heads to run at the same time. This retro-fit set comes with everything you need to adapt your current valve fittings to a new sliding-bar hand shower and rain shower combo setup! It’s a premium set of fixtures, and it commands a premium price tag. We think the solid metal construction and impeccable functionality are worthy of the investment, though! If you’re up for installing a shower bar and overhauling your whole setup, this is an excellent choice! The rain shower head has a relaxing, gentle spray pattern with big drops. It’s as good a rain shower head as many that go for this price for just one fixture! The hand unit has an all-purpose, higher-pressure output for massaging sore muscles and running off. It’s perfect for massaging sore muscles or getting a quick rinse. Both shower heads use Grohe’s excellent Dream Spray spray channel tech. It all get technical quickly, but this essentially boosts your pressure and optimizes the distribution between all the individual spray nozzles on each shower head. So, both make the most of their 2.5 GPM flow rates! They’re immersive and thoroughly relaxing. It comes with all the equipment you need to install both shower heads on a sliding rail with an extension arm overhead. There’s a hidden pressure balance valve between the fixtures, to keep things consistent as you switch between them. Having the shower bar gives you all sorts of options for seated and standing showers alike. You can adjust the height of the handheld shower head easily, as well as adjusting the angle and direction of the spray. You can wash your body without getting your hair wet, or get a back massage from the hand shower while you go about your normal shower routine! It’s all solid metal. The only parts on this assembly that aren’t solid metal are the rubberized spray tips, which you wouldn’t want to be rigid anyway. Everything else is rugged and durable. In terms of build quality, this one absolutely blows away our other recommendations (and anything else on the market). The finish is superb. It’s scratch and tarnish-resistant to such a degree that this is probably the last shower system you ever need to buy. Both heads are designed to be mostly self-cleaning. You’ll definitely want to wipe for fingerprints and mold as you would in any shower, but the spray tips are nearly impervious to hard water deposits. Any accumulation that does appear dislodges easily thanks to the flexible spray tips. One fantastic feature that you don’t see at first glance is the “CoolTouch” tech that Grohe have integrated. It uses cooling channels between the hot water and the outer surface of the fixtures to keep the temperatures on the outside from scalding you. With all-metal systems like this, that’s a huge safety plus. The diverter valve allows you to use either single shower head, or both concurrently. It actually has six positions, instead of the three options on most of our other recommendations. For each single fixture setting, as well as the combination mode, there’s a secondary eco option. The cube-shaped rain shower head and rectangular handheld unit have a funky, modern look. Combined with the bright chrome finish, it’s ideal for the stylish contemporary household. It works with any existing valve. So, all you need to do is mount the bar and connect to the water supply to get going! Everything’s incredibly simple to install, for such a high-end system. The Grohe comes with a supply elbow connection which helps angle the hose around your existing valve. That prevents tangles and mishaps.You also have the option to fix the overhead extension arm in place, or keep things loose to swivel it. As you’d expect, it’s covered by a lifetime warranty. This one also has a flawless track record for long-term performance, so it’s a very solid investment. The Grohe is pretty expensive, especially for the whole setup. We think it’s a good deal given how much you get for your money, but the asking price is still steep for some buyers. It’s easy to install but does require some modifications to your shower wall and plumbing. This is definitely not something renters should buy. If you’re looking for something to simply attach to your existing shower pipe, this isn’t for you. Which Double Shower Head is Right for You? Now that you’ve seen a whole range of dual shower heads, let’s help you decide which is the best option for you! The Peerless is the obvious choice if you’re on a tight budget. It’s the only model under $50 we recommend, and it’s vastly better than other all-plastic models. On the downside, no plastic fixture will last as long as something with at least some metal parts. This one looks and feels a bit cheap, and won’t last forever. So, if you can afford to spend more, we think you probably should. If you can’t, this will get you through until you can! The Moen is a much nicer dual shower head along the same lines as the Peerless. We recommend that any budget-minded buyers who can afford to buy this one do so. It’s a better long-term investment than the Peerless, and simply a better set of fixtures. You get more coverage, more settings, and a metal hose. Still, it’s not as well-made as something like the Speakman or especially the Grohe. The Kohler is comparable to the Moen in both price and quality. It’s a mix of metal and plastic parts, with several setting options. The main difference is the format. This one’s a better choice for people who like the simplicity of a 2-in-1 dual shower head, rather than a set of 2 independent fixtures. It’s much more versatile than the Peerless, and has far more metal parts. The downside is that it’s not as rugged as the Speakman or the Grohe. The Speakman is our top midrange choice for the average buyer. It’s super versatile, quite well made, and still relatively affordable. If you’re not planning a full retrofit, this is all you need to buy! There’s enough variety here to satisfy practically any taste. However, when compared to the impeccably well-made and well-equipped Grohe, the Speakman pales in comparison. If you can afford the Grohe and have the ability to install the shower bar to make it work, we do recommend it. The Grohe is our top pick for a dual shower head. It’s as much as we think the average homeowner should spend on a dual shower head configuration, and as nice as most of us will ever be able to appreciate. The two big downsides are the price and the fact that you have to install the shower bar along with the shower heads. This one’s not something you should be considering if you don’t own your home and have a generous budget. Our most expensive pick above, the Grohe, costs as much as we think most folks can justify spending on a dual shower head. It’s incredibly well-made, it’s enjoyable to use, and looks a treat. However, it’s not the absolute best on the market. While the Hansgrohe is almost absurdly expensive, it offers one of the absolute best shower experiences you can get, period! It’s solid metal, like the Grohe set above, and comes with a rain shower head and hand shower unit. This one has a supersize rain shower head with a 9.5” diameter, which features an air induction system to enlarge droplets and create a powerful downpour sensation. On the handheld nozzle, you have a convenient way to rinse off quickly and massage sore spots. There’s really nothing not to love about the Hansgrohe. We think it’s without question the best overall shower on the market, as well as the best dual shower head. Plan to spend a pretty penny for it, though. That luxury price tag is the only reason we haven’t included this one in our main set of recommendations. It’s simply out of range for many buyers. Dual shower heads are a relatively new category in the market, so here’s our quick guide to help you navigate your options! Each format has its advantages and disadvantages. 2-in-1 shower heads are very neat and compact, but they don’t give you as immersive an experience as having 2 distinct fixtures to work with. Likewise, it’s luxurious to have a sliding rail or 2 distinct fixtures mounted separately. You get lots of options for angles and configurations. On the downside, you’ll have to think about installation for the bar or mounts. Put some thought into which configuration best suits your needs. If you don’t own your home, you should choose something that doesn’t require any major modifications to the wall of your shower. If you own your home, it may be worth investing in something deluxe, as long as you know you’ll stick with it. As always, be sure to choose a fixture with solid, rugged build quality that you can count on for years of use. We suggest investing in metal fixtures rather than plastic pieces, whether you’re looking at a dual shower head or a standard setup. With that said, you should know that you’ll pay a premium for a dual shower head with all-metal construction. You probably can’t escape plastic entirely for less than $250. However, once you start looking at fixtures ~$100 and up, you’ll start to see more of the key components being made of metal. That includes the hose, valve, etc. Unless you’re on a super tight budget, you should spend enough to buy something with a metal hose at the very least. If you’re going to get something with lots of plastic parts (usually anything under $100), be sure you’re covered by a good warranty and a brand which will stand behind its products. In most of our other guides, we rail against chrome fixtures. That’s because they’re so often cheap coated plastic, rather than finished metal. In this category, you don’t have to worry about chrome so much. With most models, even the non-chrome finishes are still mostly plastic, and once you’re in the premium price range, even the chrome finishes are entirely metal. So, this is a rare case where we can tell you to choose whatever finish you want, without having to worry about differences in build quality! At all costs, avoid the knock-off’s and gimmicky models from brands that aren’t legitimate! They’re common in all shower fixture categories, but particularly in the dual shower head market. If you shop online, you’ll likely see hundreds of so-called shower combo kits or dual shower heads from brands with strange names, all with near-identical packaging and features. These are novelty junker items, made to take advantage of the popularity of dual shower heads. They’re not made by companies with any expertise in plumbing, and they’re often not up to US regulations for the materials used or the water they’ll consume. If you see something listed for $20, you’re almost certainly looking at something like what we’re describing. If you haven’t heard of the company, and they aren’t sold by plumbers or dealers, they’re probably not a firm you want to buy from. This is something we urge you to consider in any category. We mention this again in our dual shower head guide because there are simply so many garbage options in this category. You might think it’s a decent idea to save money and grab an off-brand model for a fraction of the cost of something by a reputable fixture maker. However, these junker shower combos can contain harmful chemical materials in their plastic parts and painted coatings, which leach out into your shower water. They often produce chemical fumes as well. Plus, they typically waste water, or fail to meet USA code. You can read more about why we’re so passionate on this front by checking out the comprehensive guide on our homepage. Of course, we think you’re best off with something that we’ve recommended. If you’re not thrilled with our picks and decide to strike out shopping on your own, beware of brands with misspelled names and products with generic descriptions. Those are two easy ways to tell that what you’re looking at is a subpar and probably unsafe fixture to use. As with any shower fixture, you want to consider the overall experience you’ll have with your new dual shower head. What kinds of things do you want it to do? What kinds of spray patterns and sensations do you prefer? If you’re expecting a lot of different things, be sure to get a setup with multiple spray features. Choose a model with adjustable heads, or one with heads which feature very distinct spray patterns. Usually, these will be your only shower heads, so make sure they cover all your bases! Think of your individual preferences, as well as the taste of anyone else who’ll be using the shower. Shower preferences usually come down to whether you prefer an immersive, gentle rain shower experience vs a power spray to wash, rinse, and massage quickly. Thankfully, having two heads means you can often get both in one dual shower head package. Most setups feature a rain shower overhead for relaxation, and a hand shower for rinsing. There are lots of options, though, so think about which configuration suits you best. Since all dual shower heads have multiple spray heads, you’ll find that any setup comes with something called a diverter valve. A diverter valve essentially directs the water from your plumbing into one or both of the fixtures in your shower. Many dual shower heads have 3-position diverter valves, which allow you to use both fixtures on their own, or both concurrently. However, some models only have 2-way diverter valves. If you buy a system with one of these, you’ll only be able to use one fixture at a time. Be sure to check before you buy, so you’re not surprised later on. Nearly all dual shower heads come with two distinct fixtures, so it’s no surprise that they tend to cost more than your average single overhead sprayer. Plan to spend $50 for the very cheapest of the decent models. Most buyers should plan on spending $100-$400 for something that will last for years of use. The more you pay, the more metal parts you can expect to see. You’ll also pay more for dual shower heads which come with sliding bars or other additional fittings. Again, if you see something priced suspiciously low (under $50), it’s definitely too good to be true. Stick with models from real plumbing companies, and avoid plastic components as much as you can afford to. Be sure to consider any setup modifications or additional costs your new dual shower head might incur. Most of the models we’ve recommended simply screw onto a standard shower pipe, so they’re easy to get set up by yourself. If you’re buying something that involves installing a rail or modifying your valve, you should probably get a plumber involved. Consider that cost, as well as the cost of any additional fittings that don’t come with your new fixture. It shouldn’t be much of a surprise that most dual shower heads aren’t conservative with using water. They’re designed to provide an immersive experience, so they nearly always use the maximum 2.5 GPM allowed by federal water standards. That’s something you should consider as you decide whether you actually want a dual shower head. In some parts of the country, usage standards are stricter than 2.5 GPM, making the majority of dual shower heads illegal to use. California residents and folks in the Western US should pay particular attention to local conservation requirements. The Kohler is the only inexpensive model we’ve recommended that’s a water saver. If you live in an area with tight water standards, you should either get that fixture or reconsider buying a dual shower head in the first place. The Grohe does have an eco mode, but since that’s optional to use, it’s not going to meet stricter water code. We hope this guide has answered all your questions about dual shower heads, and shown you at least one or two options that could suit your needs. Clicking on the links in our reviews is the best way to find all the relevant specs quickly, as well as to check current prices. For more of our expert reviews and recommendations for all things shower, go to our home page! That’s where you’ll find lots of our favorite fixtures in other categories, as well as our comprehensive guide to shopping for shower equipment.